Mark: Hi it's Mark Bossert, Producer of the Pawlik Automotive Videos and Podcast. I'm here with Mr. Bernie Pawlik, Pawlik Automotive in Vancouver, BC, Canada. We're here talking about cars. How you doin' this morning Bernie? Mark: We're, of course, speaking about a 2011 BMW X3 this morning that had a water pump problem. What was going on with this BMW? Bernie: This BMW, the owner's complaint was that an overheat warning light would come on, on the dash and along with that, the vehicle went into reduced power mode, so you couldn't accelerate the vehicle properly. That was what was basically going on with the vehicle. Mark: What sort of test procedure did you use to find the cause of the concern? Bernie: First thing we always do when there's any cooling concern, of course I ask the client, what happened to the vehicle? In this case, was there steam, did you see leakage of fluid out under car? No, no steam, no fluid. We verified that. When we looked at the vehicle, of course, checked the coolant level, it was full in the coolant bottle, there was no leaks anywhere, so we knew the problem wasn't from a leakage issue, it was more ... perhaps the water pump wasn't operating or thermostat sticking kind of condition. Maybe a radiator fan issue. The next step with this type of car is to hook a scan tool up, see what kind of information is in the scan tool and when we scanned the engine there was a number of trouble codes for a electric water pump related issues, which I'll show you in a picture in a few minutes. We basically determined that the electric water pump was intermittently failing. Mark: Electric water pump. Now that's kind of different. Why does this vehicle use an electric water pump? Bernie: Well, the simple answer of why is because BMW chose to use an electric water pump, but they're actually, reasonably common in a lot of vehicles and as vehicles get newer, they're getting more and more common. A water pump traditionally as been driven by, it's a belt driven mechanical pump and as the engine is idling, it's turning it a certain speed and as the engine speeds up, of course, it turns faster and flows more water. All very good, but in the world of trying to get the most efficiency out of an engine, any accessory run off the engine takes power. With the electric water pump, the idea is you run the water pump at the speed that's needed to do the job, to keep the engine at the right temperature. When the engine is stone cold for instance, you don't really need to flow any coolant through the engine at all for maybe a few seconds to a minute or two, depending on the condition. The electric water pump as the capability to do that kind of thing, so that's why they use it. It's basically for efficiency, fuel economy, mileage, power, all those things combined. BMW isn't the only manufacturer that uses them. Actually a lot of manufacturers, especially Europeans and their luxury cars have used electric water pumps, more as an auxiliary pump, so it'll provide quick heat to the vehicle or perhaps it'll provide some heat to the vehicle when you shut the engine off, you can sit in the car for a little while and get a bit of heat flowing through the vehicle. Electric water pumps have been used as an auxiliary pump for a lot longer than they've been used as a main pump, but this vehicle, this is the main coolant pump, it's electric. Mark: You have some images? Bernie: I do. Let's have a look here. There's our 2011 BMW X3. Pretty much, they've made this model look the same for I think 2011 up to about 2017 or '18. They all pretty much look alike. This is a 3.0 version, which is a twin turbo, a higher horsepower model. Okay. Scan tool. Here's what we found when we plugged the scan tool into the vehicle. We can disregard the first bit of information, but there's a code here, it says message: electric coolant pump missing. It's not running when it's supposed to. Engine cooling system, reduced power, coolant pump voltage low. Again, another message for coolant pump not operating. An interesting thing is, with this particular scan tool we have, you can actually drill down into these messages and it'll show freeze frame data, when the item occurred and certain conditions that were occurring. It's interesting with this code here, I don't have a picture of it. You can actually see that this issue happened four times, previous to the time where it had set a lot of warning lights off, where the pump had been failing. It's a pretty good indication that, that was the issue. I often say, we can't just plug a scan tool in and find out what the problem is. In the case of this vehicle, this is a very common failure item, so you can be pretty sure, once you see these codes that that's the issue. Here's the electric water pump. Bolts up to the side of the engine. You can see inlet and outlet, big electrical connector here and yeah, that's basically it. Big motor inside here and commanded by the computer to run when it needs to and at various speeds, so it does not just run on full out, it can run at any infinite number of speeds. Here's a thermostat. This is another item we replaced while we did the job. It's not necessarily required but there's no extra labor to do it and this is also an electric part here. There's an electrical connector here. Thermostat's ... again, these used to be a purely mechanical item, but on many newer vehicles, they're now electrically controlled so that the computer can send it a signal to open the thermostat, as well as it being mechanical, there's also some computer overrides. I'm just going to stop ... actually, you know what, there's one more picture I want to look at, to show too and that is the instrument panel. This is the instrument panel in the BMW and what's very curious about this is there is a temperature gauge in this vehicle, however it's not an actual coolant temperature gauge, you can see it actually shows a little oil can. This is actually an engine oil temperature gauge. It's not really a very reliable indicator of engine overheating. The other thing interesting is, you see how high this temperature goes, a 170 degrees of coolant temperature, your motor would have been cooked long before it ever reaches that temperature. Engine oil temperature, it works differently than coolant, it warms up slower, it gets hotter over time and on a turbo charged engine, a lot of the time, if you're going down the highway, this temperature will go over a 120, which is fine, it's normal. I don't know why BMW chose to put an engine oil temperature gauge, it's kind of a useless item. They really should have put a coolant temperature gauge. 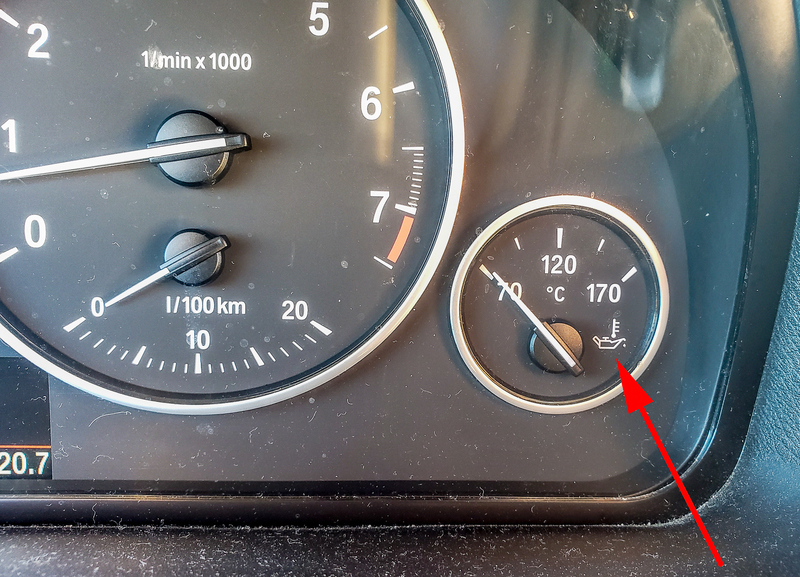 If you have a BMW, have a close look at this gauge and you can't really count on it, quite the way you can with a coolant temperature gauge because it'll give different readings. Just a little tip and bit of advice there. Mark: You alluded to this is a common failure item on this model of BMW or is it on all BMW vehicles? Bernie: There's a lot of BMW's that use this engine type and a lot that use electric coolant pumps and electric main water pumps and they'll all fail, it's an enormous failure item. They do on all of them. The more I work on cars, the more you can count on certain things. If you have a 2.5 litre Subaru timing belt engine, you can be guaranteed you're going to be doing head gaskets. I mean, it'll happen. It's kinda neat when you have those kind of guaranteed failures. Then you know when you're buying a vehicle, you know what to expect and what's going to happen. I mean, this is one of the things with a BMW, the electric water pump, it will fail at some point in time. Mark: Is this an expensive repair? Bernie: Well, expensive is always a relative term, but I would say yes, it is. There's a fair bit of labor involved, the part is very expensive. Canada-wise, it's in the $700-$800 range for the pump, so it's a lot of money for the pump. They're not really any cheap substitutes out there and you do want to use something that's good quality, even that thermostat is over $200 bucks for that electric thermostat. Again, they're expensive parts, bit of labor, it's not your 1970 Chevy non-air conditioned four door sedan, water pump, where you can buy a rebuilt pump for 40 bucks and thinking way back when labor was a lot cheaper too. In today's dollars, maybe a three, four hundred dollar job, whereas this BMW is 15, 16 hundred bucks taxes in. It’s up there for sure. Mark: You mentioned the temperature control, any other items that you serviced at the same time? Bernie: I mentioned the thermostat. We also replaced the engine coolant at the same time. It used to be that flushing antifreeze and cooling systems was a really common procedure on cars, the technology of antifreeze is really changed over the years, so much on the automobile. It used to be that you would flush your cooling system twice a year and thank God we don't anymore, because I hate to think of where all of that antifreeze used to go, down the drain probably. Nowadays, modern engine antifreeze and coolants are good for one or two hundred thousand kilometres, even more on some cars, you know five or 10 years flushing intervals, they really do last a long time. Whenever you have a problem like this, this is a good opportunity to actually replace the engine coolant because it's probably near the end of its lifespan, it's a good opportunity to do it. Coolant flush and also the thermostat. Again, the thermostat wasn't the problem, but there's no extra charge for labor to do the thermostat because it all comes out with the water pump, so why not do it at the same time because it's probably gonna fail, who knows, next week, two years, whatever it is, but you have to take a lot of the stuff back off to do it. Mark: You alluded to other European manufacturers, does anyone else use electric water pumps? Bernie: Well, a lot of manufacturers do and the ones that come to my mind, I'm thinking Toyota Hybrids, I mean they have electric water pumps. A lot of accessories on hybrids are all electric. A lot of Prius's, I can't remember after 2011, they don't even have a drive belt, everything is electrically driven, the air conditioning, the whole thing. That's the one vehicle I can think of for example, but many vehicles use 'em and they're going to get more and more common because again, it's about having control over these items, where it's not just a pure mechanical device drawing power, you can go, hey, it's going to draw less power, that's going to give you better fuel economy and power and have better engine performance overall. Even oil pumps in some engines, they have an electrical component to them or they're electrically driven. Again, it's about having that computerized control. Mark: How reliable are BMW X3's? Bernie: They're pretty reliable, but BMW tend to have more issues perhaps than a lot of cars, so you'll spend more money on this car then you will on an equivalent SUV, of a lot of others, but I mean, generally, it's a nicely built car, good quality. This one has a lot of fancy stuff on it, so you can expect that you'll pay more money to fix it over time. Generally, pretty reliable car. Mark: There you go. 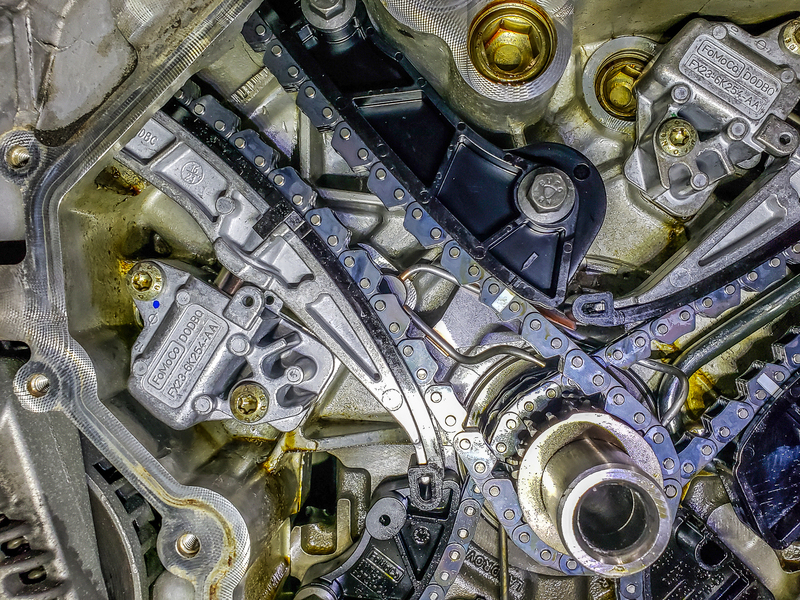 If you're looking for service for your BMW X3 or any model of BMW, or you have an electric water pump that needs replacing in Vancouver, the guys to see are Pawlik Automotive. You can reach them at 604-327-7112 to book your appointment. You have to call and book ahead because they're busy or check out our website, pawlikautomotive.com. YouTube channel: Pawlik Auto Repair, close to a 1000 videos on there on all makes and models and types of repairs. As well, thank you for listening to the podcast and thank you Bernie. Bernie: Thanks Mark and thanks for watching, we really appreciate it. Winter Driving Tips, Don’t Burn Out Your Wiper Motor! Mark: Hi. It's Mark Bossert, producer of the Pawlik Automotive podcast, and we're here with Mr. Bernie Pawlik. Pawlik Automotive in Vancouver. Vancouver's best auto service experience and 19 times winner of Best Auto Repair in Vancouver as voted by their customers. And we're talking cars. How you doing this morning, Bernie? Mark: So, we actually have a little bit of snow here in Vancouver, which has freaked everybody right out and that's a hit and miss affair. We don't always get snow. You have a bit of a tip for us around windshield wipers. Bernie: I do. Yeah, so here's a little preventative tip. To prevent more serious damage like windshield wiper motor, wrecking your wiper motor, your wiper arms and linkage, or your ... I mean, on the cheap side, the wiper blades. It just occurred to me, as Mark said, we don't get winter here very often, so we tend to be a little lackadaisical with our operating of our cars, at least some of us. I know there's, I have a few people in my family, my wife, my kids, even myself sometimes, we tend to drive home and just leave the windshield wipers on because it'll probably be raining the next day or we just kind of forget and don't really think of the fact that perhaps it's going to freeze overnight or there's going to be three inches of snow on the window. When you go to turn on your, when you go to start your car, the wiper motor's already, the wiper's already switched on and your windshield wipers could be frozen to your windshield or trying to move three or four inches of wet snow, which is really hard on them. My tip is, make sure you shut your wipers off, and that includes front and rear, when you shut your car off at night. Whenever you actually park your car, you should make sure your wipers are off. It's easy to forget about it in this climate because we don't have to deal with it very often. I'm sure there's some people watching this podcast going, "Duh, I do that already," because a lot of people are smarter in winter than we are around Vancouver and areas like this. Just a tip if you're not in the habit of doing it, save yourself some money. I'll just share a couple of photos. There's basically a ... what that ... what we're looking at is a windshield and these are some wiper blades buried underneath. Again, like I'm saying, you don't know whether these are frozen to the window or whether you're about to be moving a bunch of snow. So if the wipers are switched on, of course that's a, that is, that can cause some problems. Again, here's a rear wiper blade. Now this one you can see is actually frozen onto the ... this is a Suburban. It actually has a little pedestal that holds the wiper blade in place down at the bottom of the window. This piece is actually frozen to the pedestal. Again, that's going to cause an issue. Here, the vehicle, this is kind of bit of a worn out switch, but an example of how I found the vehicle. The wipers are actually turned on, even before the car, you know, the car was left overnight. That, again, is something that's going to cause a problem. Mark: So what sort of damage do you see from this? Bernie: On the simple side, the easiest damage would be a ripped wiper blade, which is cheap and easy to fix. More often, it'll wreck wiper motors, or cause linkage to either bend or break, or sometimes just the nut that holds the linkage to the wiper arm will be forced loose and just needs to be tightened and realigned. That's kind of the simplest scenario. Quite frequently, we replace wiper motors and it seems like a lot of rear ones tend to, we tend to replace them quite frequently, I think because people forget about the rear wiper. It's in the back, they don't think about and leave it on, it's frozen to the window, and burns it up. Mark: So what sort of cost are we talking about? Bernie: Well, wiper blades can be ten dollars a piece on the easy side of it. Readjusting linkage could be $30 to $50. Once you start getting into the realm of motors, though, you're getting into several hundred dollars. It could be even into a thousand dollars on some cars. So that's the kind of damage you definitely want to prevent. Mark: A thousand dollars. So, besides making sure your switches are off, do you have any other recommendations for wiper longevity in winter? Bernie: Yeah, so absolutely. So not only make sure the switches are off, but the other key thing is when it's cold out, and this doesn't necessarily mean there's snow on the window, but if there's frost and it's frozen, make sure your wiper blades are not stuck to your window. This is another thing that happens and it's simple. Just go around, grab each wiper blade, front and rear if you have rear wiper blades. Just grab it and make sure it physically moves off the window and that'll prevent a lot of damage because something we see a lot of too. It doesn't have to be snow. It can be ice. One thing with snow, it's not such a big deal to use your wipers as a snow brush where you have dry powdery snow, but a lot of the snow we get around Vancouver can be heavy and wet and that can be really difficult for wipers to move. You really want to brush off any thick accumulations. You know, half an inch is no big deal, but when you start getting into three or four inches, that's tough. Mark: And of course, clearing the top of your car Vancouver, which is almost like a rite of passage for people not to do. Have a foot of snow on top of their car. Mark: Which is extremely dangerous. Bernie: Yeah. It is, and you know, the other thing too and brushing off your hood as well, because a lot of times you get snow blowing up on your hood and that creates blind spots and often wipers get all kind of gummed up. You know, having your window washers free as well is another tip I can give. You know, a lot of times washer nozzles are located on the hood. Well, they're not going to do any good if they're buried under three inches of snow. So again, you know, keep that area clear and clean because that'll help you. It keeps things safe and helps you get from one end of the journey to the other in one piece. Mark: Well, there you go. If you need some service on your wipers, the guys to see are Pawlik Automotive. You can reach them at 604-327-7112 to book your appointment. You have to book ahead because they're busy. Or check out their website, pawlikautomotive.com. Of course, the YouTube channel, Pawlik Auto Repair. Hundreds of videos on there about all makes and models of cars and repairs. And of course, thank you so much for watching the podcast. We appreciate it. Thank you, Bernie. Mark: Hi. It's Mark Bossert, producer of the Pawlik Automotive Podcast. We're here with Mr. Bernie Pawlik, Pawlik Automotive in Vancouver. Vancouver's best automotive service experience, and of course, 19-time winners of Best Auto Repair in Vancouver as voted by their customers, and we're talking cars. How are you doing this morning, Bernie? Mark: So, 2013 Mercedes ML550 that had some rear shock absorbing problems. What was going on with this fine German SUV? Bernie: It's a fine German SUV, it's a really nice vehicle. It's a 550. It's kind of a notch below an AMG ML63, and just a super awesome vehicle, twin turbo V8, lots of power, nice features. It's a super nice vehicle. Anyways, so the owner brought it in for a B-Service a few months back and one thing we'd noticed was the left rear shock absorbers leaking fluid. So that was definitely something that needed to be replaced, so this was the day and we did the service on the shock absorbers. Mark: So, why was it leaking? Bernie: Shock absorbers will just leak when they get old. They have seals and to be honest, it's a six-year-old vehicle. I think it's got about a 140K, so I guess it's getting up there in mileage, but things just wear out. Shock absorbers are filled with fluid. These ones are not a hydraulic shock like you do find on some Mercedes products where they actually have pumped oil into them, this is just the fluid is just contained within the shock absorber, but it's a critical part of any shock absorber action is fluid, pistons, valving and things like that, that reduce the shock when you hit bumps. Mark: So, did you notice anything while driving the vehicle? Bernie: Yeah, you can really notice. Probably initially when she brought the vehicle in for service, the first service there wasn't really much noticeable in terms of ride but, it's been a few months now and more and more fluid's leaked out and you notice when you hit bumps you can hear a banging noise in the back of the vehicle and there's also the ride of the vehicle is not great. It tends to bounce around a fair bit because the shock absorption, of course, is pretty much gone on that left, rear corner. Mark: Just for shock, explain maybe again pedantic-ness, alert, we're talking about a shock absorber basically stops the bouncing of a vehicle that the springs would normally do when you go over a bump. Bernie: Exactly, so if you had no shock absorber, if you have just a spring, as soon as you hit a bump, the vehicle bounces up, and then it bounces down, and goes up and down, and up and down, until eventually the oscillations all come out of whatever the energy that was put into the spring dissipates, well that can often take a long time. If you've ever driven in a vehicle where the shock absorbers are completely blown, it's a really uncomfortable feeling, the car bounces around. Not only is it uncomfortable, it's actually dangerous because the weight of the vehicle is not really in contact with the road as much as it could be. And worn shock absorbers, sometimes you think, "Ah, they're not that important." But they really are pretty critical. Brakes will wear out faster, vehicles don't handle as well, they don't stick on the road as well. So they're a critical safety feature in a vehicle, not to mention comfort. I think that answered your question in a long-winded way. Mark: Sure. Is there anything about the shock absorbers that's unique on this Mercedes? Bernie: Yeah, they are actually. These are like, I wanna call it electro-hydraulic, but I think that's actually the wrong term for it. GM has a term, magneto-hydraulic, it uses special fluid in the shock absorber, and it actually has little metal particles in it and when it's electrically charged or magnetically charged it changes the direction of the particles so it can change, let's say the bounce rate of the shock absorber, the absorption. So, it'll change the handling of the vehicle so they're pretty high tech shocks. Let's just get into some pictures right here. 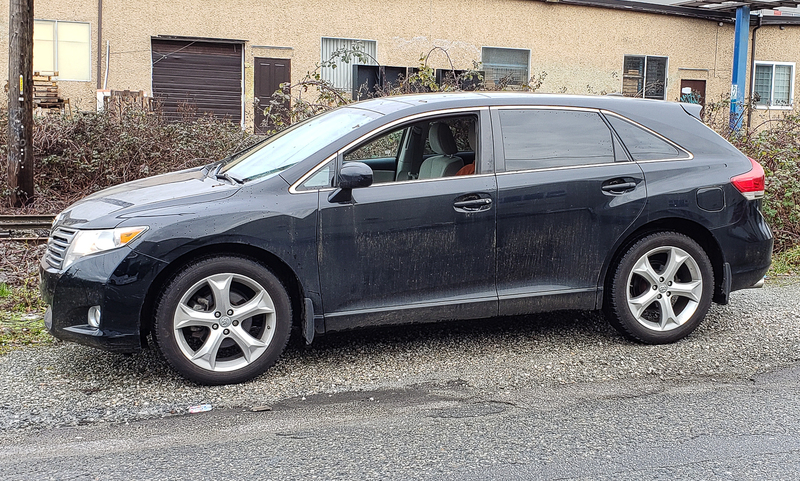 So, there's our ML550, unfortunately not washed, it's a cold day in Vancouver and the vehicle would've frozen up had we washed it. It's a rare, very cold moment in Vancouver. So here's our shock absorber on the vehicle and this is kind of showing the bottom end of the shock and you can actually see some oil and fluid dripping on the ground. So this has been going on for a couple of months. I'd say there's probably not a lot of fluid left to have been leaked out of this particular unit. There's another view, a better sort of view of the shock, you can oil just seeping out. This is a dust boot. You can see the oil just seeping out, down the side of the shock. Whenever you see oil leaking in a shock absorber it's a sure sign that if it isn't bad right now it's gonna be bad pretty soon cuz the fluid is a critical component of the shock. And there's the new unit installed. Again, there's this actuator unit here. Electrical connector. And that's what's really makes the magic of these electronic shocks, that's part of the process. That and the special fluid. Mark: So are there still springs in this vehicle? Bernie: There are, yeah. So they use an air spring. I'll just go back to the picture. Mark: Yeah I saw it there in the background. Bernie: Yeah, there's the air spring, right there. So these use air suspension. I can't remember what they have in the front, but on the rear there's air suspension. It's a good idea in an SUV vehicle where you're gonna be putting weight and needing to adjust the height of the vehicle, so definitely the rear has them. They probably do in the front too. But yeah that's the spring. It can have a coil spring too on some models, but this one, it's a Mercedes, you gotta go full out. Put all the good stuff in. Mark: As you already alluded to, this type of shock isn't unique to Mercedes? GM also has it? Bernie: No, it's not. Lots of different manufacturers use 'em. But you won't find them on a lower end car, they'll only be on the higher end. On Lexus, or Infinity, Lexus, Cadillacs, a lot of different German vehicles. Bernie: Yeah, there's a variety of them, but they're all high end stuff. Mark: And so once you've got the shocks changed, of course everything was running great again with this vehicle? Mark: And how are the Mercedes MLs for reliability? Bernie: Pretty good, but again we're in the luxury SUV category. It was a lot of things that can go wrong and expensive things, like these shock absorbers, for example, are quadruple the price of what an average shock absorber would be. So you pay a lot for that kind of thing. These vehicles, I've often said they're kind of fair for reliability. We've talked a lot about the diesels and they have issues. The gas motors are really good, rarely run into any issues with them. I'm always personally a fan of the gas motor, I just think they're better, although the diesel's certainly more economical. You can just expect that you'll spend more money on this vehicle because of what kind of vehicle it is. Mark: So there you go. If you're looking for service and repairs on your Mercedes-Benz MLs or any Mercedes-Benz product in Vancouver, the guys to see are Pawlik Automotive. You can reach them at 604-327-7112 to book your appointment. You have to book ahead, they're busy. Or you can check out their website: pawlikautomotive.com. Hundreds, perhaps even maybe a thousand on there now. Videos, articles on different makes and models of vehicles, as well as the YouTube channel: Pawlik Auto Repair. Hundreds and hundreds of videos on there of all makes and models of cars, repairs, all sorts of details, us two making fools of ourselves for many years. Or of course thank you so much for listening to the podcast, we really appreciate it. And thank you Bernie. Bernie: Thank you Mark, and thanks for watching. Great to have fans. Mark: Hi, it's Mark Bossert, producer of the Pawlik Automotive Podcast. We're here with Mr. Bernie Pawlik, Pawlik Automotive in Vancouver, 19 time winners of Best Auto Repair in Vancouver as voted by their customers and we're talking cars. How you doing this morning Bernie? Mark: So we have a 2008 Grand Caravan that had a wheel bearing issue. What was going on with this minivan? Bernie: Yeah. So the owner of the vehicle brought in to our shop with a complaint of a rattle noise. Technician Nigel took it out for a little drive. It wasn't more than a few feet into the parking lot where he heard a hideous grinding noise coming from the vehicle. The owner actually hadn't described but that was the first thing that he noted. Mark: And so what did you find was wrong with the van? Bernie: Well it was pretty apparent. Wheel bearing noises are pretty distinct and it was pretty apparent that this was more than likely a wheel bearing noise so we took it for a further road test and then hoisted the vehicle and found probably the noisiest wheel bearing we've ever encountered in our career. Bernie: It's on the right side by the way. Bernie: I have a video. Unfortunately for some weird reason the sound didn't transfer over so I'm going to show the video then I'm just going to play the soundtrack on my phone because that's really where the juice is of this video. So here it goes. So, there's the video, spinning the bearing. But let me just play this sound track too because this is where you'll- this is the most interesting part. World's loudest wheel bearing. You heard that okay? Bernie: So yeah that was basically instead of seeing the bearing spin of course the noise was kind of the key part and I don't know why the technologies odd sometimes. But, anyways that was basically the noise. Just an absolute solid metal on metal rotational noise. I mean I've never heard anything quite so loud. Mark: It's a meditation bell. Bernie: Yeah absolutely. It kind of had that tone to it. Mark: So, where's the actual bearing. I only see rusty metal. Bernie: Yeah, so the bearings actually inside this area here, the part that was being spun, and I'll just actually play this one more time. So, the part that's spinning, that's the hub. And the part that's being held solid, that's the mounting plate. The bearing sits inside this area here. So this hub here, this is where the wheel bolts on, and the axle shaft goes to the drive axle shaft goes through the hub, the centre of the hub and that's driven of course by the engine and transmission. And then the bearing sits inside here. Mark: So is this a pretty common design, a wheel bearing? Bernie: Yeah, very common. This is what's called a unitized wheel bearing and very common. I would guess that maybe 50% or more of vehicles on the road use this type of design. It's very common. Mark: So you can't actually take that apart and pull the wheel bearing out? You replace that whole piece, is that how that works? Bernie: You replace the whole piece. It's a bolt in, bolt out. Generally pretty straightforward but one factor you get of course is rust. And as you can see on that part. The parts over time rust in place and it can sometimes be quite an effort and get it out. They even use these wheel bearings on Ford 350 pick-ups, Dodge trucks, Chevy's, they'll use that type of design too and getting those bearings out of course they're humongous, getting those out we actually have special tools that can help pop them out of place. They often require a fair bit of effort once they get old and rusty. Mark: Are these bearings a common replacement part. Bernie: They are but it's, there's nothing really where we can say this specific vehicle all the bearings go or you know it's going to go at this particular mileage. They really fail at different rates. It's entirely possible you may have a vehicle and go 400,000 kilometres without replacing a wheel bearing. Or you might have one wear out before 100. Sometimes just one side will wear, sometimes the other one will wear. There's no rhyme or reason but the good thing about it is you'll hear a noise coming, once you get it diagnosed and verified you can just replace that part. And it's not, I mean this bearing is so loud this person would had to have been driving for quite a long time with quite a loud noise getting worse and worse before they chose to fix it. Mark: There's lots of parts that I can think of on cars that need to be replaced in pairs, like shocks, brakes, tires, are wheel bearings like this? Bernie: They're not. These are basically a one side, there's no reason to change more than one. Things like shocks, brakes, and tires, especially on the front of the vehicle, they have different, say for shock absorbers those are different rebound rates so if we don't change both shocks at the same time you might have one corner of the vehicle will bounce differently than the other. Or brakes, if the friction materials aren't exactly matching in terms of the rotors, pads and calipers you can get brake pulls, tires same thing, you'll get handling issues. With the wheel bearing it's just a very precision machined part and if one isn't worn the other one doesn't need to be replaced. You just replace the worn out one and do the other one at a later time. Mark: So there you go. If you're looking for replacements of your wheel bearings on any make or model of vehicle in Vancouver the guys to see are Pawlik Automotive. You can reach them at 604-327-7112 to book your appointment. You have to call them, book ahead because they're busy. Or, check out their website, pawlikautomotive.com. There's hundreds of, literally hundreds of videos and articles on there about car repairs as well as there's are YouTube channel, with again hundreds of videos over eight, almost eight years of doing this as well, thank you for watching the podcast and thank you Bernie. Bernie: Thanks Mark and thank you for watching we really appreciate it. Mark: Hi, it's Mark Bossert, producer of the Pawlik Automotive Podcast. We're here with Mr. Bernie Pawlik. Pawlik Automotive in Vancouver, Vancouver's best auto service experience, 19-time winners of Best Auto Repair in Vancouver, as voted by their customers. And we're talking cars. How are we doing this morning, Bernie? Mark: So your company, as a policy, basically doesn't really give over the phone estimates. Is there a reason why. Why Don't You Give Me A Price Over The Phone? Bernie: So, yes, we rarely give over the phone estimates, and there's a few reasons why. Largely, we want to make sure that when you come into our shop that you get what you expect. If we tell you it's $200 to do a certain job, you come and it's $400, or it needs a whole bunch more work, that really sets a stage for not a great relationship, and probably some disappointment on your behalf. The thing about estimating car work is it's pretty complicated. Even if you think, oh, I know it's this one part, often there's a lot more involved. I can think of a couple of examples. 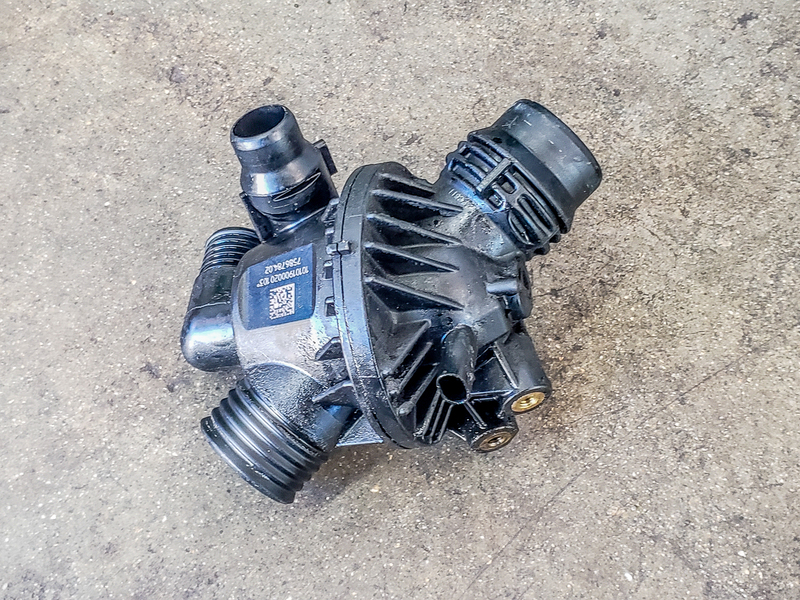 Recently we had a client who had a Mazda 3, called us up and said I need an alternator replaced in my vehicle, very sure that it was the alternator. Now, we didn't actually do an over the phone estimate for him. He brought the vehicle in. We looked at it, and found that the battery terminal was loose. Now, had we told him it was $600, for example, to do the alternator, I mean of course, he would have been very pleasantly surprised that the bill was under $100. But oftentimes when someone would call and say, "Hey, I need an alternator," and we say it's $600, and we get the vehicle in the door, and by the way that's just a round, off the top of my head guessed price, we may find that there's belts that are worn out. There are bolts that are seized. A number of other things, some things we don't even know until we take it apart. But, generally speaking, we don't know what you're really going to need until we look at the vehicle, until we actually start taking things apart. Mark: So you're just trying to create a good customer service experience by setting proper expectations prior to actually seeing the vehicle. Bernie: Exactly. Another example we frequently get people asking, "I need front brakes in my car. How much is it?" Well, our normal response is, "We need to do a brake inspection first to see what you need." There are so many things that can affect brakes. I mean, normally, it's just brake pads and rotors, but often the calipers can be seized. Sometimes if the vehicle's older, it'll be brake hoses. Does the brake fluid need to be flushed? There's a variety of things, so we really want to make sure we do the right service, and with the right quality parts. Again, knowing who you are, what your expectations are as a client is important, but we need to know what the vehicle actually needs. It's truly a waste of everyone's time to make an estimate over the phone if we don't really know exactly what you need. Mark: This sounds almost like you're caring more about the relationship with your customer rather than just, wham, bam, here's our price, $29.95 for an oil change. Bernie: Exactly. Thank you, Mark, for mentioning that. That's exactly right. We really care to establish a relationship with you based on honesty, trust, and that we're going to do the right thing for your car. That takes a bit of a process. Again, a feel between whether we're the right shop for you, whether you're the right client for us, and whether we're going to do the car service the way you want. That involves a bit of a dialogue, a conversation as to how long are you going to keep your car, what you're going to do with your vehicle. I guess we could just stick brakes on, and we could give you an idea of the price, but really that doesn't serve you well in terms of what are your driving needs? Maybe you need a better grade of brake pad or something. We tend to look at the whole vehicle to kind of give you a big picture of what you need. So, yeah, the relationship is really what we're looking at. Mark: Cars have gotten just a touch more complicated these days. I'm sure there's opportunities where somebody might say, "Well, I need a new X," and there's five other things that might be wrong up or downstream from that particular part that they're referring to. Bernie: Absolutely. I mean, cars are extremely complex. I'm thinking, again, of a couple of things where people might call and say, "I need an oxygen sensor replaced," because there's a certain trouble code in their vehicle. Without us diagnosing it and rally looking at it in detail, it's hard to know for sure that it is in fact the oxygen sensor, a wiring problem or something else. I mean, most of the time it could well be the oxygen sensor but, again, without doing a proper diagnosis it's hard to know for certain. Another area I'm thinking, I had a client recently who called, how much is a thermostat on a particular BMW? Well, it's a lot more complicated than that. Often with BMW's there's plastic hoses, pipes. Do we need antifreeze, are the belts worn? It's a little more complicated than just changing the thermostat, and every car's different. It isn't the same thing every time. There's a variety of things that need to be changed. So, yes, the complexity makes a big difference. Mark: And the complexity of how the car's actually been driven and maintained in previously also makes a huge difference, I'm sure. Bernie: Yeah, exactly. Exactly. I was thinking, back in the days, you know, when cars needed tuneups. A lot of shops would advertise a $69.95 tuneup for a four cylinder engine. Well, you knew you were going to need four spark plugs, and it was going to take ... They're all kind of the same. There wasn't a lot of variety, but nowadays, I mean, every car's different. There's a different amount of time to change the spark plugs. The types of spark plugs vary. I mean, a tuneup is not really a service you need any more, but there are different tuneup items that can be needed. So, again, it's all kind of customized. Mark: And each manufacturer builds their vehicle in a different way, and their computer systems are different, etc., etc. Is that right? Bernie: Exactly, and sometimes if you replace a particular part, especially if it has any electronic component, it'll need to be reprogrammed to the vehicle. This is happening more and more with newer vehicles. It's not just plug and play any more. Things are getting more and more complex. Mark: So there you go. If you're looking for some service on your vehicle in Vancouver, and you want honest guys who are going to look after you for a long time, the guys to see in Vancouver are Pawlik Automotive. You can reach them at 604 ... Bernie, you do it. Bernie: 327-7112. You can also watch our podcast. I know you know the addresses better than I do, but just search Pawlik Automotive on the internet. You'll find our podcasts, our videos, there's tons of them out there. Thank you, Mark. Thank you for watching. Mark: Hi, it's Mark Bossert, producer of the Pawlik Automotive podcast. We're here with Mr. Bernie Pawlik, Pawlik Automotive in Vancouver, Vancouver's best auto repair experience and 19 time winners. 19 time winners of Best Auto Repair in Vancouver as voted by their customers and we're talking cars. How are you doing, Bernie? Mark: So we have a 2017 Chevrolet 3500HD pickup, pretty almost brand new vehicle, what was pre-purchase inspection. What was going on with this and your new truck? Bernie: Yeah, so the potential buyer brought this vehicle to us for a pre-purchase inspection, wanted to check out the condition of the vehicle before he bought it. So we proceeded to do our usually awesome pre-purchase inspection. Mark: So of course this is a very documented procedure with hundreds of points of checking, so what did you find when you did this? Bernie: Well, on the road test, which is the first part. Chris who did the inspection noted, he said there's a possible noisy wheel bearing from the left front. That was basically the only thing he noted otherwise the truck drove really nice. But when we got up in the hoist, we found some extremely interesting things and I wanted to share that with you. So let's just get right into some photos. So here's our 2017 Chevy truck, I mean beautiful condition, looks really nice. Bit of a gloomy Vancouver day, so could have showed nicer on a sunny day. Getting into some other photos. Here's basically the odometer, 46,000 kilometres. So it's still, for a Chevy truck, I mean really barely broken in, almost new. But a fair bit of use for a two year period. When we got under the vehicle, that's where the interesting things started to happen. They'd undercoated this vehicle over mud, which was just absolutely bizarre. So we'll just go through some photos here. This is the exhaust crossover pipe, you can see this vehicle has been exposed to an awful lot of mud. So right away, you could tell the usage of this vehicle is probably either in the mining industry or oil and gas, somewhere been driven off road in a lot of muddy conditions, maybe construction in a muddy area. But transmission pan's covered in mud. But this black here is basically undercoating that's been sprayed under the vehicle. So, somewhere along the line, someone has tried to mask the vehicle, make it look better underneath than it really is, but this undercoating is done over top of mud. That's why it looks so bumpy, which is absolutely crazy. So we found numerous, numerous areas like this. Here's the back of the vehicle, this is a computer module. I believe this is the fuel pump module, coated over in undercoating. Of course it'll be a real nightmare to do some diagnosis and testing. And not so much mud here, but there's some. Again, it's been undercoating over top of mud. What else have we got here? Another example, I mean this is where the torsion bar goes through the front frame. Again, kind of hard to see, like in real life, it's way more noticeable. But again, here's the metal here and this is all just a huge layer of mud sprayed over. We've got this, no we've already looked at this. Did we already look at this? I'm not sure but here's another example. Lots of mud here. This is the front exhaust pipe, catalytic converter. Now actually this is facing rearwards, actually. So where the torsion bar mounts, again, just caked mud. And to get into what, you know. So up in front, this is the front skid plate, you can kind of get an idea of the mud. I mean this is a three inch thick layer of mud. That's the four wheel drive actuator. Another similar view of the same area. Again, you can see the level of mud, so this was caked all over underneath the vehicle and just sprayed over top. I don't know if there's anything else. And of course, they didn't even do that great of a job because there's just a bit of over spray in the oil filter and the oil pan and that's it. I can't stand looking at anymore, it drives me crazy. It's that bad. Gotta put some humour in here because it's just awful. Mark: So, okay. So what's the big problem here of other than they're trying to hide something that this thing is coated in a ton of mud that should have been cleaned off, what's the problem created by undercoating over top of mud? Bernie: Well I think you alluded to the biggest thing there. To me, it's like, "What are you hiding?" Or "Why are you trying to make something?" It's like putting icing on a cake made of mud, it's like when you cut the icing open, it's just mud underneath, it's not cake. So, I mean that's the first thing is, like why would you even spend the energy, if you're gonna do anything proper, a really good thorough pressure washing and cleaning underneath the vehicle would be the very first step before you undercoat it and try to make it look a little better. And maybe that would actually not be a bad thing to do, because it's been bounced around the bush. But the other bad thing about it, of course is mud absorbs water and over time, when you get mud, if you wanna take good care of a car, you've always gotta flush the wheel wells of the car out, because a lot of times you get mud and it'll sit in little corners and water will sit in there and that's a perfect way for the moisture to attack the metal and eventually rust it out. So, keeping things clean, mud free is important because water, it attracts water and it just keeps sitting in certain spots. So over time, this truck will definitely run into a number of problems, whether it's electrical connectors being damaged from water and mud to the fact that the undercoating's even kind of retaining the mud in place and keeping the moisture in the mud because it's like a rubberized type coating. Mark: So, I can assume probably and correct me if I'm wrong, that if you went and looked at this vehicle yourself at the lot and drove it, you'd think, "Wow, this is a great vehicle. They've probably got a good price on it." Making a really huge assumption, but let's just go with that. It drives good, it looks good, it feels good, this is a great vehicle. Because you probably yourself, wouldn't necessarily go underneath the vehicle to see this. And this could happen with a reputable car dealer or a second tier kind of car lot or even a private seller. So how do I protect myself from this happening? Bernie: Yeah, great question. Pre purchase inspection. It's really the key. Bring it somewhere, have it looked at. And I've got to tell you an interesting about it. So this is the second truck we've looked at for this owner. The last truck we looked at was a 2018 with 20,000 kilometres and he phoned initially to us and said, "I wanna bring this thing in for inspection," and I kind of thought, "You know what? That truck is so new, why bother?" So we did the inspection on it and we actually found some problems. There were some worn front end parts. There was a CV joint boot that was leaking grease, and those are the couple things I remember, but there was a couple things and this truck is like I say, it's a year old. Obviously been used pretty hard. No mud underneath like this, so it wasn't that bad. But right away it just turned him off, he goes, "I don't wanna buy this truck because it's got stuff." Now some of those things may have been covered by warranty because the truck wasn't that old, but again, just a turnoff. But it just made me realize, you never know. You think "Oh, this truck's not that new." I make these assumptions, because I work on cars all the time. A lot of times it'll be fine, it's only 40,000 kilometres on a two year old truck, what could be wrong? Well, here's the evidence. So a pre purchase inspection is really the only way to be 100% sure. You know, some people go, "I don't wanna fork over 150 or 200 dollars." But you know what? You bought this truck, you're gonna be in there wasting many times that amount of money over the years over repairs that you wouldn't have needed to do had you bought the right vehicle in the first place. Mark: So, once this was all done, was there anything else wrong with this vehicle? Bernie: Well, we did find a few things. There were some front end parts, like some tie rod ends that had some excessive play. The tires were worn out. I mean that's something you couldn't see, and they weren't severely worn out, but worn out to the point where, for the price of the truck, I would have expected to have a new set of tires put on it. Again, and those can be negotiating tools, but again with those worn out front end parts, you go, "Well, where has this vehicle been driven?" It's been banged around logging roads or back roads, gravel, through roads that probably don't even exist. So that takes its toll on a vehicle. Mark: Is there a time where you wouldn't recommend a pre purchase inspection. Bernie: Not really, I mean you should do it any time. Even if you're buying a $3000 vehicle, because you never know what might be wrong with it. And I mean I have bought vehicles in the past without doing inspections on them because sometimes I can get a pretty good feel for a car driving, but I've been in the business for a long time and I've bought a lot of crap. So I know the kind of telltale signs of stuff to look for. But if you were saying, you're going, "I don't want an inspection on this vehicle," I mean the very least if the buyer had crawled under this vehicle and looked with a bit of a discerning eye, and you have some automotive intelligence, you would have able to say, "Hey, wait a minute. This is kind of shady, I really should have this looked at." So I'd say just any time you should. And there are some very reputable dealers around, but this vehicle shocked me because it was actually from a place where I would have never expected to find a vehicle like this. So, usually name brand car dealerships, they only sell good cars because they value their reputation. But again, this has taught me, you know what? You can't really tell. Somehow this thing slipped by their whatever procedures they have. Mark: There you go, if you need a pre purchase inspection on your new to you vehicle, the guys to see in Vancouver are Pawlik Automotive. You can reach them at 604-327-7112 to book your appointment. You have to book ahead because we're busy or check out our website, pawlikautomotive.com. We have a huge YouTube channel with hundreds of videos, Pawlik Auto Repair. And of course, thank you so much for listening to the podcast and thank you Bernie.